Veteran filmmaker Volker Schlöndorff is in top form in Diplomacy, a taut thriller that manages to build suspense even though it’s pretty clear what the outcome will be. It’s August 24, 1944, and the Allies are at the gates of Nazi-occupied Paris. Hitler has decreed that, should the French capital fall into enemy hands, it will only be in ruins. Shortly before dawn, the military governor of Paris, Dietrich von Choltitz (Niels Arestrup), paces in his headquarters in the Hotel Meurice, preparing to carry out Hitler’s orders. All has been prepared, with Teutonic precision: the bridges across the Seine, Notre Dame, the Louvre, the Place de la Concorde, and the Eiffel tower have been mined for demolition. All that remains is for him to give the command, and the city will be destroyed. And yet, von Choltitz hesitates. Could he have moral qualms? Does he fear the Allied powers? Raoul Nordling (André Dussolier), the Swedish Consul General, suddenly appears in von Choltitz‘s chamber. Through the course of a long night, the canny diplomat attempts to persuade the steely commander to spare the City of Light. As these two very different men engage in a verbal game of chess, the future of Paris hangs by a thread. 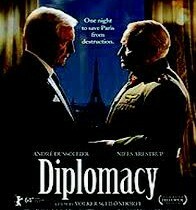 Diplomacy is a valentine to Schlöndorff’s beloved Paris. Though the film betrays its talkie roots as a stage play (by Cyril Gély), Niels Arestrup‘s brilliant performance portrays the excruciating dilemma of a man held hostage to his circumstances. This theatrical tour-de-force is dedicated to Richard Holbrooke, late US diplomat extraordinare. The world could use more such statesmen. This review cited on Diplomacy‘s Wikipedia page.